Here at F&SF, we’re open to experimentation and for the past year or so, we’ve been publishing one reprint a month on our Website. Last month, the free story was “The Political Officer” by Charles Coleman Finlay. A few days ago, someone posted on our message board (http://nightshadebooks.com/discus/messages/378/12233.html?1219150161) that he wanted to read that story. I explained that it was no longer on our Website but he could buy a copy of that back issue from us or from Fictionwise. As I did so, I realized that I was putting a reader in a position where he had to decide if he would pay for something he could have had for free just a few days earlier . . . which doesn’t strike me as a good position. I know that I don’t like being asked to make such a choice. So I started to wonder: has short fiction been devalued by the fact that so many places offer it for free online nowadays? I was thinking of this question in terms of contrast with trilogies. The format of a trilogy has been around for a long time, but I think it’s accurate to say that in the 1970s and ‘80s, book publishers (especially the team of Lester and Judy-Lynn del Rey) trained readers to expect fantasy fiction to come in series formats, particularly in sets of three. For instance, Stephen Donaldson’s original Chronicles of Thomas Covenant were one book—the del Reys split it into three volumes and published the trilogy to great success. Nowadays, it’s noteworthy when someone published a fantasy novel and nothing indicates that the book is the start of a series. I look at trilogies and the form appears to me to be thriving. But I don’t see many publishers giving away the books for free. By contrast, I see publishers posting short fiction for free in many places, but I don’t see many of those publishers reaping rewards for their efforts. I think short fiction giveaways have been good for individual authors, but are they working for publishers? Also, I realized that I’ve done something extremely stupid. I’ve run an experiment without trying to measure the results. Sure, we’ve looked at the number of hits our online stories and columns get, and we’ve done one or two other things to measure the effects of our online publications, but we’ve never done a survey. When you read a story online that you like, do you feel inclined to support the publisher of the piece? Have you ever subscribed to a print magazine on account of a story you read on their site? Most magazine publishers post their Hugo- and Nebula-nominated stories online for free. If F&SF started charging the cost of an issue to read these stories, would you do so? Do you think the prevalence of free short fiction online has made you less inclined to pay for short fiction? Please note that I’m trying to keep the discussion just to fiction (not articles). If you would care to do so, I’d be grateful if you’d include your age with your post. No need to get specific—I just want to know if you’re in your teens or if you’re in your eighties. And finally, please be aware that I plan to convert this post into an editorial for the print magazine, so don’t post anything here that you wouldn’t want me to reprint. If you’d like to comment but don’t want to do so in public, you can use the Contact Us form on our Website (here: http://www.sfsite.com/fsf/contact.htm). Write “DNQ” on your email if you don’t want to be quoted. That’s all there is to it. I’ll post here when we run out of the giveaway copies. Special offer for reviewers, bloggers, newsgroup posters and people who just like to talk about books in public: in May, PS Publishing will release Template, a stand-alone Archonate novel that I consider to be my best work yet (even though it was written in 2003). I will send an rtf file of the book to anyone who commits to review, blog, post or otherwise harass the world about it. Just send me an e-mail at "himself(you know what symbol goes in here)archonate.com" and I’ll shoot you a copy. I find it tremendously annoying that Hughes is not better known than he is. My cunning idea is that it might be fun if a bunch of reviewers on LJ should all agree to read and review Template on the same day. LJ doesn’t lend itself to the same kind of communal participation as rasfw but I think this could be worthwhile. Any volunteers? [Current Target Date: May 11th] I probably should have encouraged people to mention this on their blogs and livejournal accounts. Consider this said encouragement. I also find it tremendously annoying that Hughes is not better known than he is. I read an advance copy of Template, and I have to say, it’s one of the best–if not the best–things Hughes has written to date. So please consider participating in the review-a-thon. Or just go out and order a copy! The Martian Child DVD Giveaway Winner! 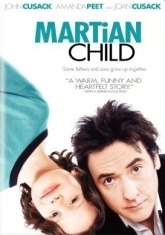 Congratulations to Jacob P. Silvia whose entry in our The Martian Child DVD giveaway contest was chosen as the winner. 2. Choose the director and/or screenwriter for the job. 4. Come up with a nice Hollywood tagline for it. 5. To enter the contest, post a comment to this blog entry with your answers. The winning entry will be the one we feel did the best job playing producer. So creativity counts! Tagline: "Are you being watched?" Win a copy of The Martian Child on DVD! The contest starts now and will end Sunday, March 9 at 11:59 PM. We’ll announce the winner on Monday, March 10. This promotion is made possible by the generous contribution of one DVD by the folks at New Line Cinema and mPRm Public Relations.